We traveled to Edinburgh for a long weekend as Rico already needed to go up for work on that Thursday—extending the trip seemed an obvious choice to escape for a few days! Thursday was spent primarily working, but Friday brought our first day of wandering and exploring. As we were staying (the Apex Waterloo Place Hotel) very close by to the old town, we thought it would make sense to start there. After grabbing some jacket potatoes from The Baked Potato Shop for lunch, we walked the Royal Mile for a bit and then, based on a recommendation from others, took a detour down Victoria Street. 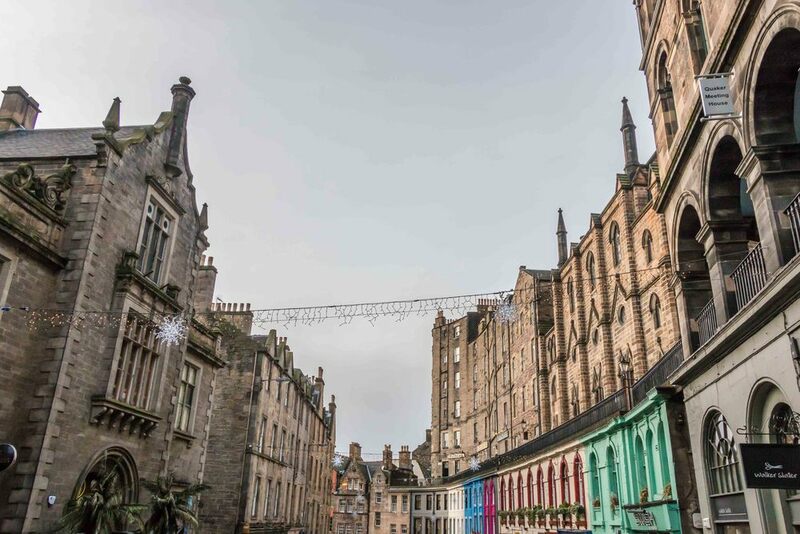 The street is a colorful, cobblestoned street winding its way downhill from Edinburgh’s main street toward Grassmarket and hosts a series of boutique shops and cafes. Museum Context was of particular interest and we spent a chunk of time rummaging through prints, knick knacks and home décor, even finding our souvenir to take back home! 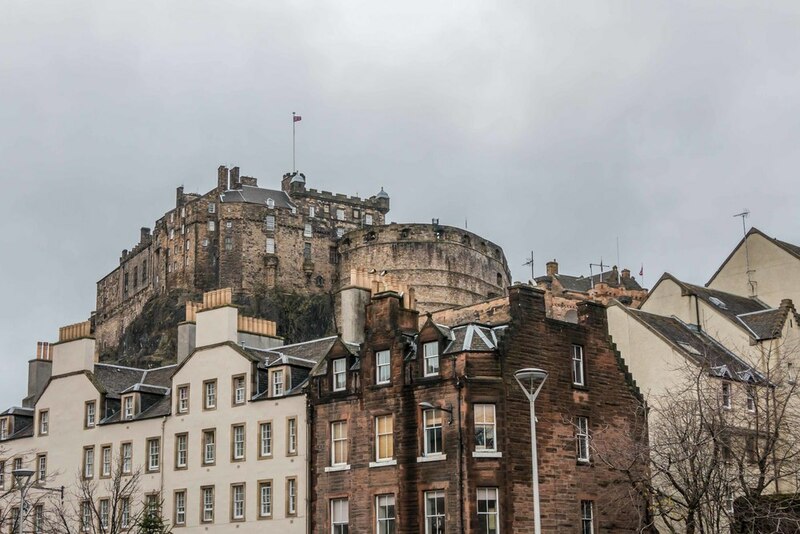 Grassmarket offered some great views of the castle overhead and after appreciating the sight, we continued on to Armchair Books, with floor-to-ceiling shelves of used and antique books. 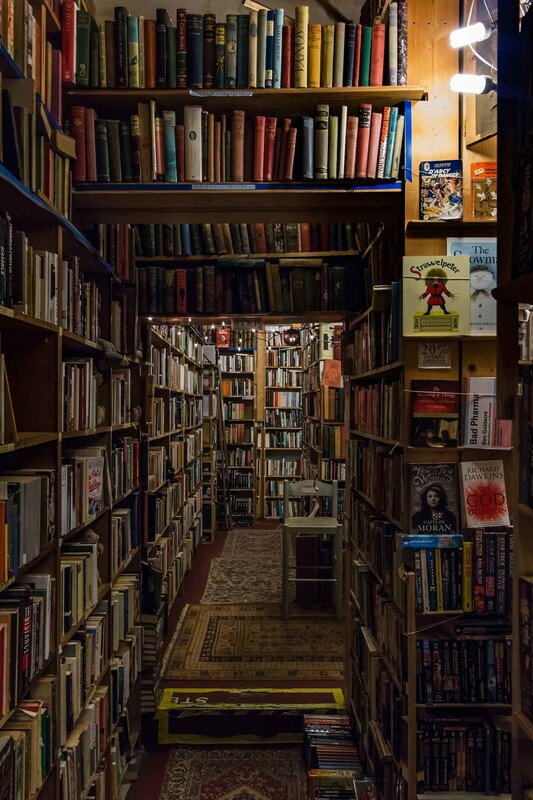 Our main mission here was to flip through some old fairy tales, particularly original Alice in Wonderland books with their decades old illustrations. 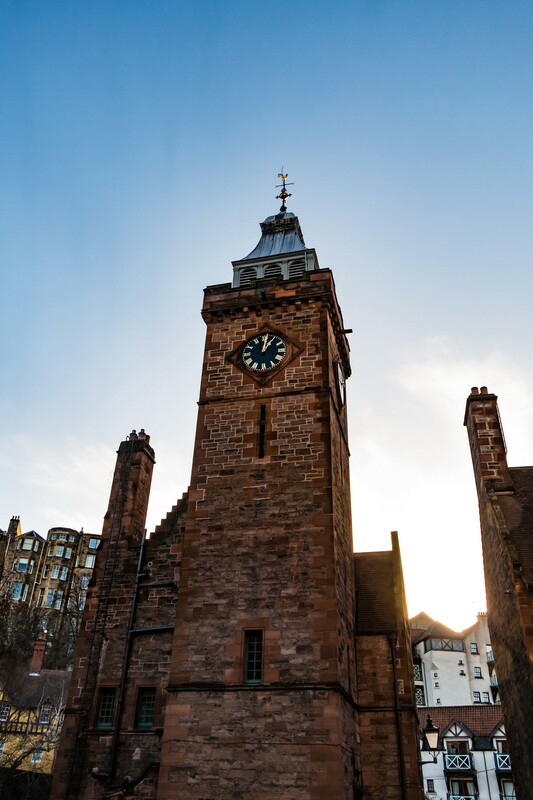 After breathing in the sweet smell of aging paper for some time, we reversed direction and made our way to the grounds of Greyfriars Kirk. While the church was not open for visiting, its surrounds were very beautiful and offered another interesting perspective from which to appreciate the city and especially the castle. We even stumbled upon past the back side of the grounds a group of young children enjoying recess, running each and every direction and playing a variety of schoolyard games! At this point we wandered back up to the Royal Mile on the way back to our hotel. 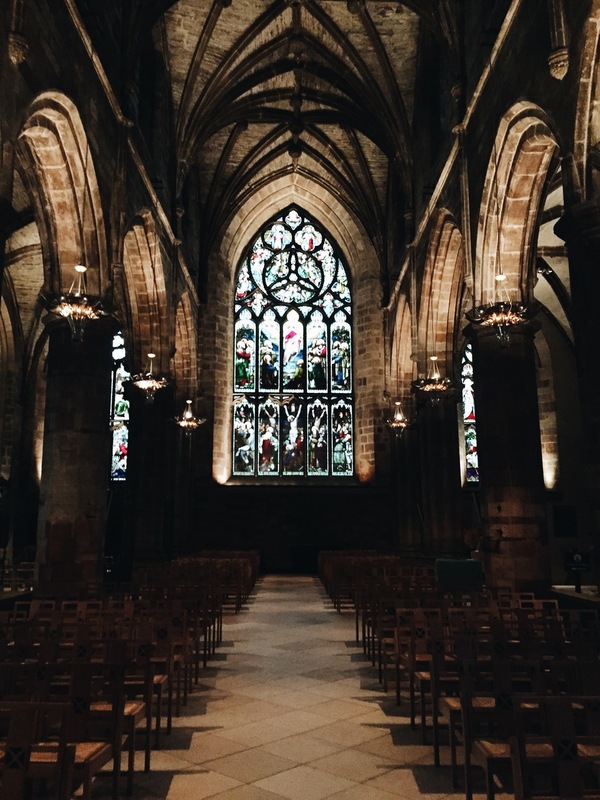 St. Giles' Cathedral caught our eye and we decided to slip inside to check it out. It did not disappoint, with beautiful chandeliers and stained glass. After dinner we decided to go back out to see some of the city at night. The castle seemed like a good vantage point from which to judge where we’d find Christmas lights. Once we got up, we were able to appreciate the castle in its dramatic lighting and scope out where to head next, but not before having to deal with extreme gusts of winds that had swept the area that night! It was probably quite the visual to see the two of us struggling back down arm-in-arm attempting not to be blown off the hill. 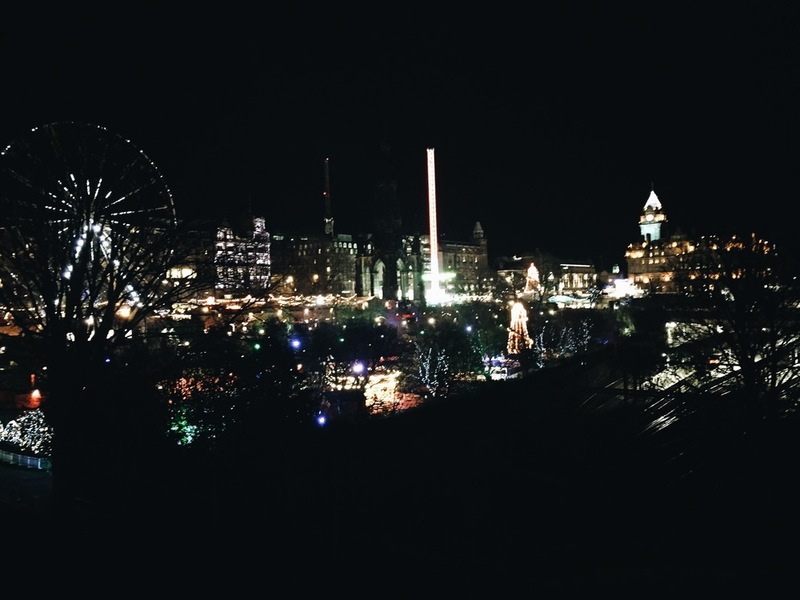 We set our sights on the Christmas market being held along Princes Street. 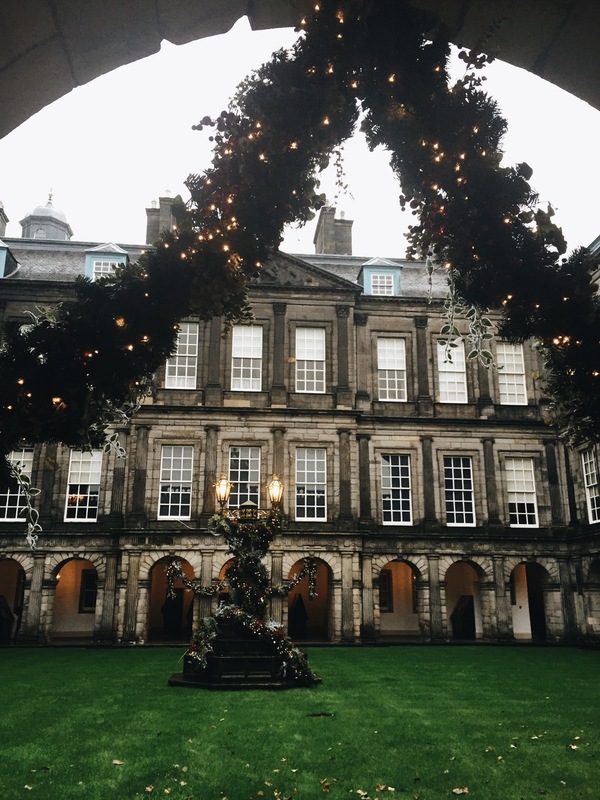 We strolled through, with the smell of mulled wine and German sausages wafting throughout. There was even a Ferris wheel (nonworking at that point due to the wind), an ice rink and Santa Claus himself! With that we ended the evening and prepared to rest up for our next full day. The weather was not ideal our next day, but we made the best of it. We had a slow low key morning and then ventured out in time for lunch at The Holyrood 9A. Rico had the BBQ burger, Britt got the falafel burger, and we split regular and sweet potato fries. The burgers were easily some of the best we’ve had! 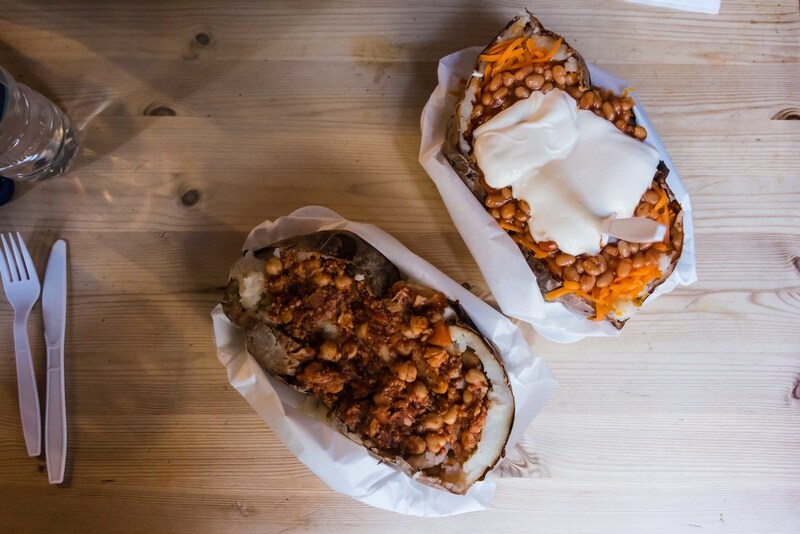 Good food has a way of really enhancing travel and setting the mood for an enjoyable day. 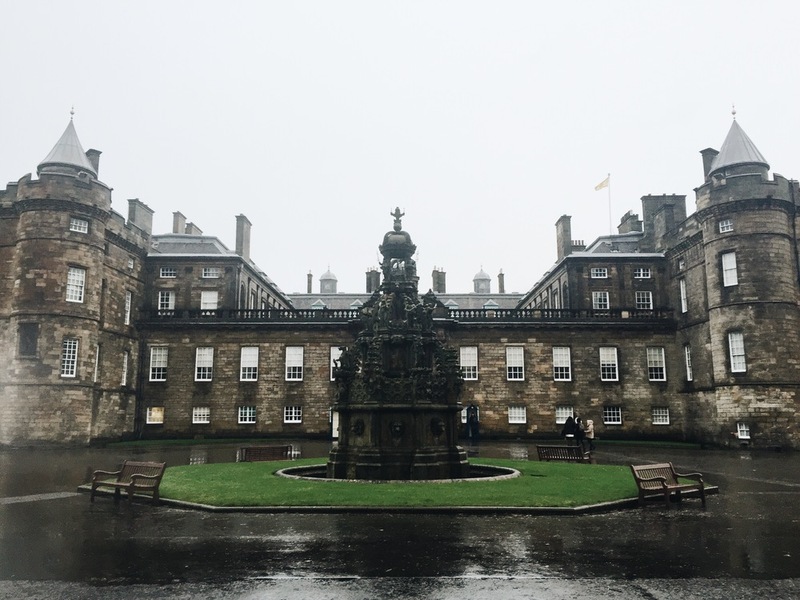 With our bellies full we made our way to Holyrood Palace at the other end of the Royal Mile. 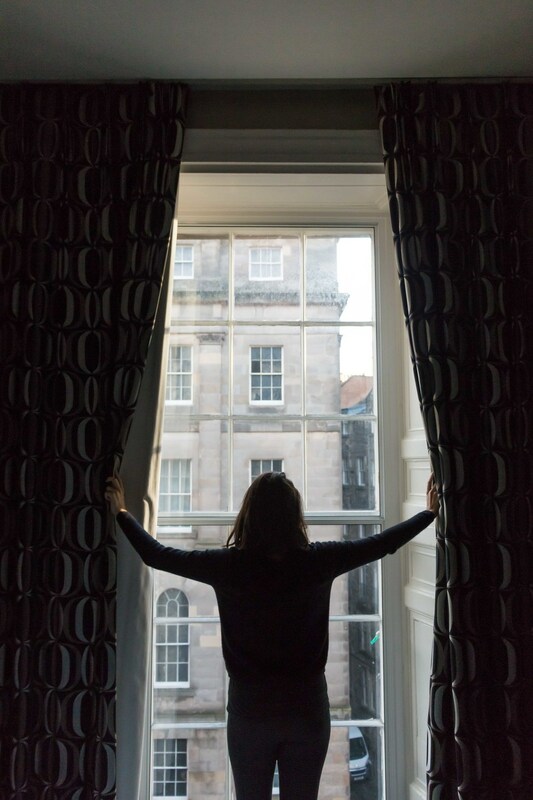 When the Queen comes to visit Edinburgh, this is where she stays! There was a nice display of photos in the courtyard chronicling the Queen’s life throughout the years which set the context for our visit. The inside of the palace was beautiful, especially because it was decorated for the holidays. In addition to the standard opulence and grandiose exhibited by places like this, there were Christmas trees, garland and ribbon everywhere—even the dining room table was set with holiday plates, glassware and centerpieces! On our way out we stopped at the ruined Holyrood Abbey and then made our back up the Royal Mile. Our next stop was La Barantine Victoria, a café on Victoria Street that we had discovered the previous day. 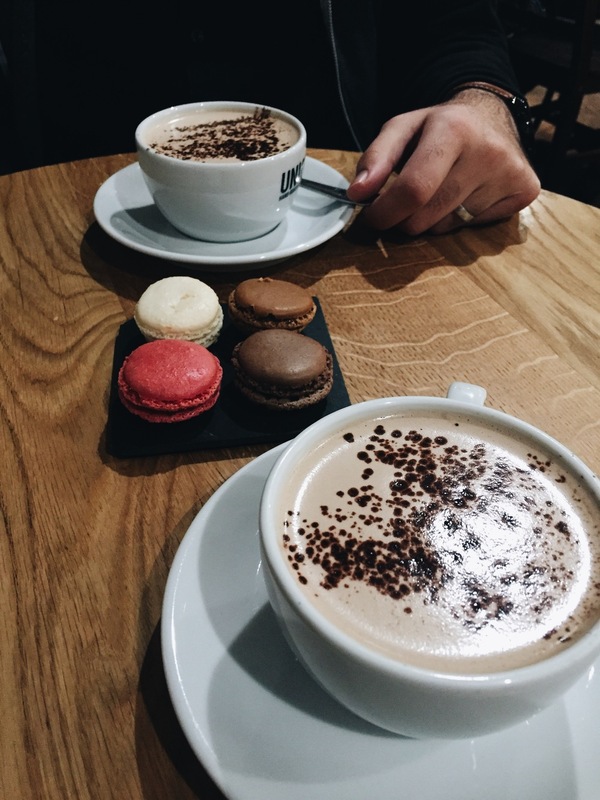 We made it a habit each day to stop in for a snack of hot chocolate and macarons. With a French wait staff and authentic French food and drink on the menu, the café felt like a little slice of Paris in Ediburgh’s old town! 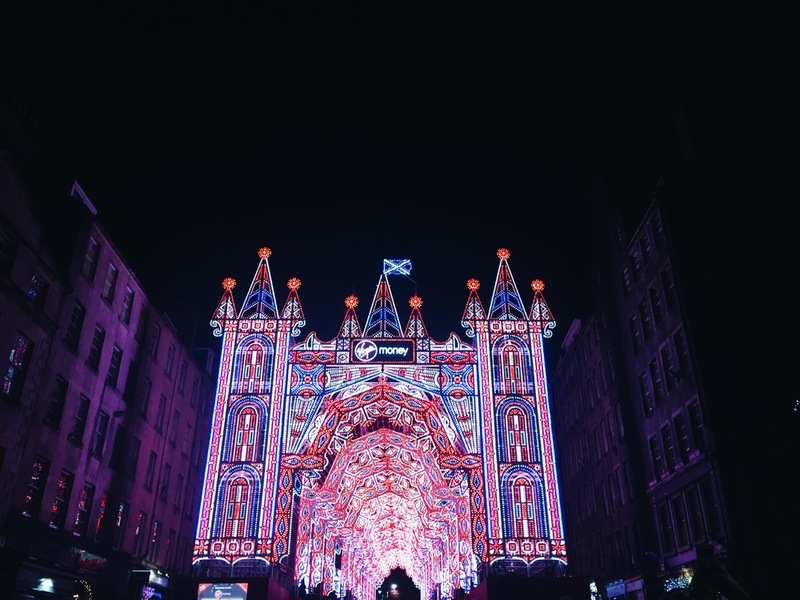 We capped the night off with a viewing of one of the nightly light shows on the Royal Mile. A large, tunnel-like structure shaped like a castle was with thousands of multi-colored lights was assembled right there in the middle of the city. Each show ran for about 20 minutes and featured a different singing group with a coordinated light show to go with the Christmas songs. Nothing better to get you in the Christmas spirit! Our last day in Edinburgh started with seeing the sun rise from Calton Hill. We woke up early and made the short walk over to the base of the hill. After a quick hike we were high above the streets with a view of the city on one side and the hills of Holyrood Park on the other. The sky turned all shades of pink and blue as the sun peered over the horizon and lit the city with brilliant sunlight which was so absent the previous day. With the early morning golden light still shining, we walked to Edinburgh Castle and beat the crowds to visit the inside. The castle was more of a collection of buildings within a protective, not unlike the Tower of London. Cobblestoned streets spiraled up to the summit of the hill, dotted with old buildings that served different purposes throughout history. Visitors are allowed to walk through most of the buildings to learn about their uses and what life up above was like hundreds of years ago. Among the most interesting things were the Scottish Crown Jewels, the old prison for POWs, and the Scottish National War Memorial (with volumes of books containing the names of Scottish soldiers killed in battle throughout history). We couldn’t help ourselves from stopping by The Holyrood 9A for lunch again, and once replenished, we set off for our last stop of the trip. Dean Village is a small residential area by the Water of Leith. 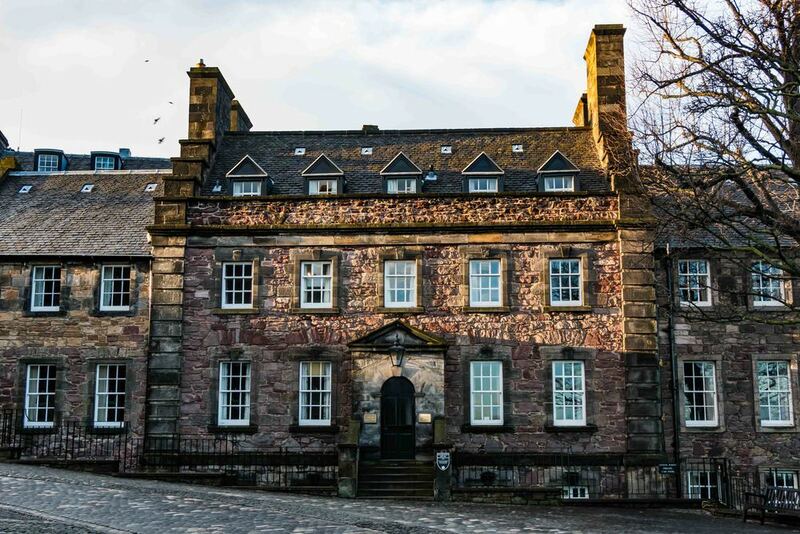 We were able to walk through some other picturesque residential areas on our way there which gave us a nice look into Edinburgh’s modern residents and their way of life. 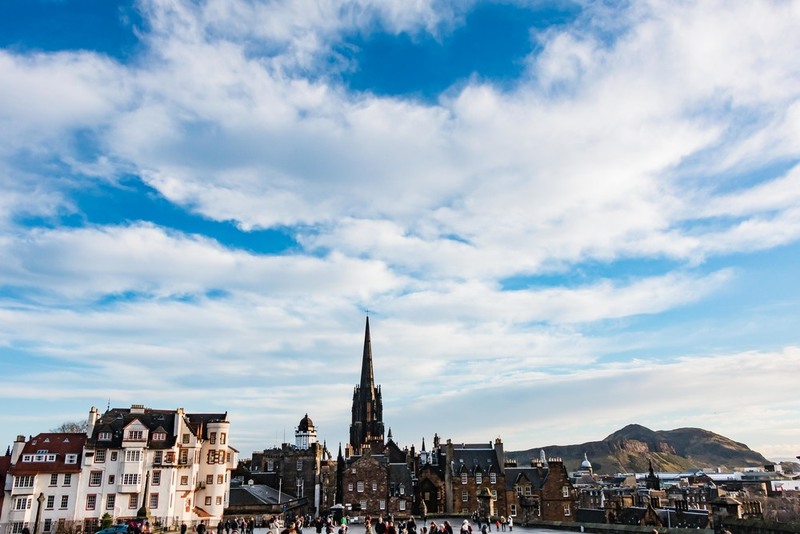 Unfortunately our time in Edinburgh was up, but knowing how much we enjoyed our time there and also how easy it is to visit from London, we are confident we will be back soon!